My mother makes RAWDICULOUSLY DELICIOUS vegan banana bread using a regular old banana bread recipe with vegan ingredients! Try it sometime! 3 teaspoons ENER-G Egg Replacer with 4 tablespoons water (equivalent to 2 eggs) (necessary? IDK! I think a banana is a great egg replacer so maybe just another banana? Who needs the egg replacer jargin?! 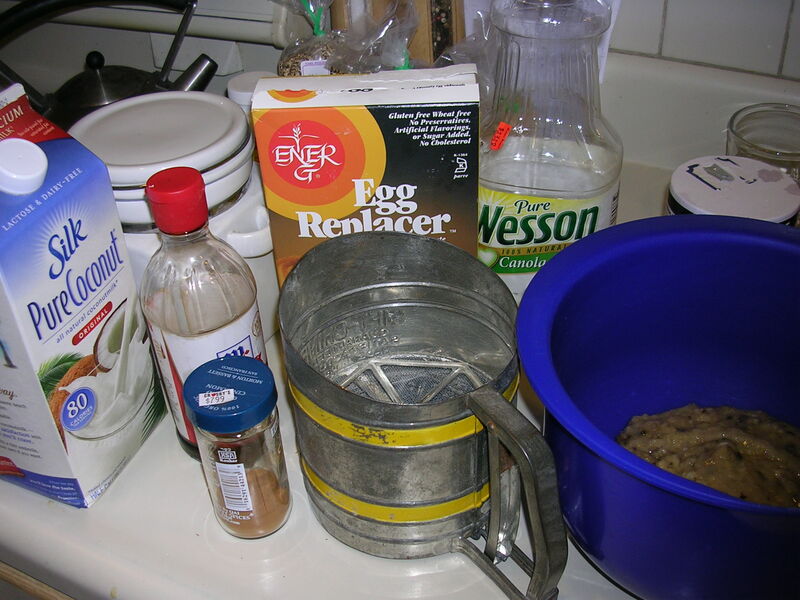 mix in flours baking soda, baking powder, salt, and walnuts. Scrape bottom to combine thoroughly. Transfer batter into pan. Sprinkle sugar and cinnamon on top. Bake for about an hour until a tester inserted into the center comes out clean. Cool in pan for 10 minutes. Then tip out of pan and transfer to cooling rack.